What happened to prisoners incarcerated for domestic crimes (not war) before and during the outbreak of the Great War? 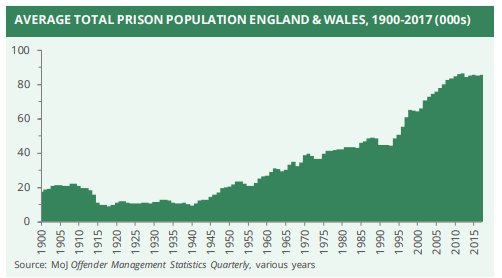 Using a UK report, in 1914 the prison population dropped around 5000, but 11,000 prisoners remained throughout the war. In perspective, this population would have been nearly a division! Conscription was adopted before and during the war across the European powers. Would this typically lead to a pardon of minor crimes in exchange for military service? Furthermore, with the threat of death for desertion or disobedience - would it not have been prudent to take all prisoners, regardless of their crimes and place them on the front? Given the shortage of manpower all powers faced, this could well have been a boost, and surely fewer resources spent on the home front. This has been a question it's hard to find material due to the large quantity of material that comes up on prisoners of war. Although there are a number of examples of prisoners being conscripted or allowed to volunteer for military service in other wars (see some examples here: Penal military unit), instances of this happening in World War I seem to be practically non-existent. The Military Services Act of 1916 does not appear to make any direct mention of prisoners. However, there a couple of 'near' cases worth mentioning. the inmates’ pleas to serve seem to have finally fallen on receptive ears. Warden Robert McKenty stated that men were indeed paroled so that they could serve in the military. When they returned from the war, the Evening Bulletin wrote, “they brought wound stripes, service bars, honorable discharges, a boxful of decorations, sergeants’ and corporals’ chevrons (insignias).” Their service was framed as “winning back their citizenship” and “making good” after their trouble with the law. The French Foreign Legion. This probably doesn't qualify, but it's worth a mention as the legion did enlist criminals so it's more than likely that some served during the war. There were also cases in France (for example, in Alpes-de-Haute-Provence - pdf) where civilian prisoners were used in non-military roles. a regular soldier sentenced to 12 months in prison in April 1914. Released from Winchester on 6/8/14 "on mobilization. Unexpired portion of imprisonment remitted." Assuming the above to be reliable, it is quite possible that there were other such cases, though the above case may be exceptional as the man was already a 'regular soldier' when he was sentenced. There are a couple of other similar, possible examples here. Consider also that both prisons and the military were full of young males, and that millions of these men were now in the military and were thus not around to offend on the home front. As to why governments didn't use prisoners, I can only deduce that there would be the burden of having to prevent possible escapes from the army once prisoners were enlisted. Given that desertion was a significant problem by the time conscription was introduced in Britain, it is hard to see how this added burden would have been welcomed by the military. Note: I have only searched in English and French. Someone else may have more luck searching in German, Italian or Russian. Not the answer you're looking for? Browse other questions tagged military 20th-century world-war-one or ask your own question. Countries which banned Ferdinand the bull? Which countries have used rail bikes in their armed forces? Which was the last war in which swords were used?